Passion fruit (maracuya in Spanish) is a South American favorite, especially in desserts. 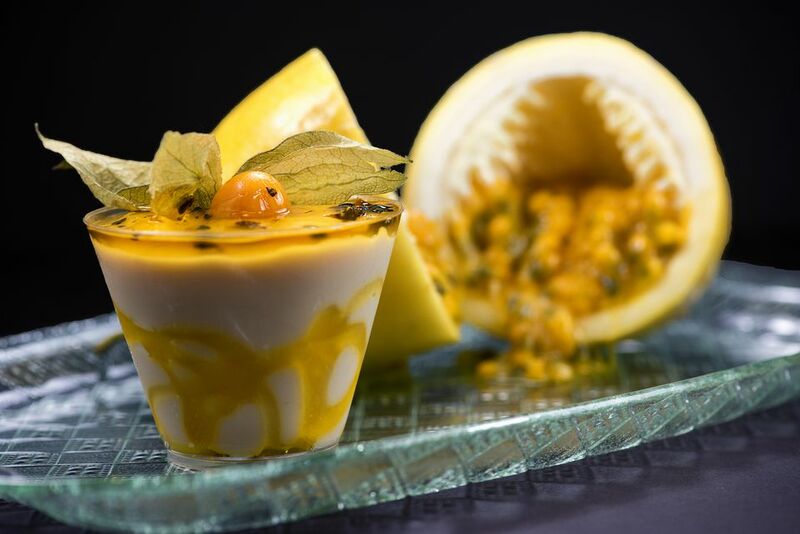 "Mousse de maracuya" is one of the best ways to enjoy its distinctive tropical flavor. This mousse can simply be served in parfait glasses and topped with whipped cream. Serve it as a mousse "cake," using a mold, with a coconut macadamia crust and a raspberry sauce. Slice the passion fruits in half and scrape pulp into a saucepan. Heat pulp on low heat, stirring until it dissolves slightly and becomes more liquid; do not boil. Strain the pulp into a measuring cup and let it cool; you will need 3/4 cup. Reserve a few seeds for decoration. Place 1/4 cup water in a small glass bowl and sprinkle gelatin over the water. Heat in the microwave for 15 seconds and stir. Repeat until the gelatin is melted and dissolved. Do not boil. Add the gelatin and the rum or liqueur to the passion fruit juice and mix well. Chill the mixture in the refrigerator for 30 minutes, stirring occasionally. Mix 1/3 cup sugar and 1/4 water in a saucepan and heat to boiling. When the sugar mixture reaches 250 F, remove from the heat. Beat the egg whites with a standing or hand mixer until they form peaks. Slowly add the hot sugar mixture to the egg whites, letting it run down the side of the bowl as you continue to beat. The meringue should form stiff peaks. Continue to beat the meringue on low speed until it cools. In a separate bowl, beat the whipping cream until soft peaks form. Fold the passion fruit/gelatin mix gently into the meringue. Do not overmix. Mix a small amount of the meringue/passion fruit mixture into the whipped cream, then fold all of the whipped cream back into the meringue mixture. If you are not going to use a mold, spoon the mousse into individual serving bowls, chill until set and serve with whipped cream and fresh fruit. To use a mold with a smooth surface, such as a glass bowl, lightly grease the mold with a small amount of vegetable oil. If you're using a loaf pan, line the pan with wax paper and then lightly grease the paper. Pour the mousse into the mold. Mix the chopped macadamia nuts, coconut, and melted butter together. Sprinkle on top of the molded mousse. Chill for at least 4 hours or overnight until mousse is set. Turn the mousse out onto a serving plate. Garnish with whipped cream, sliced fruit, passion fruit seeds and raspberry sauce.